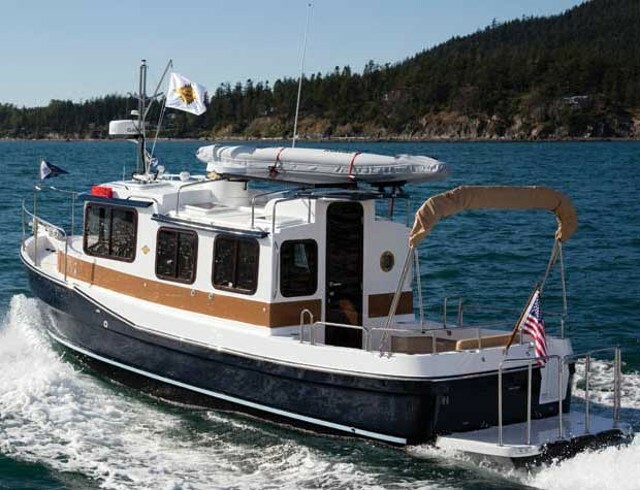 Long range cruising ability meet fuel efficiency, speed, and affordability, in the American Tugs 365. 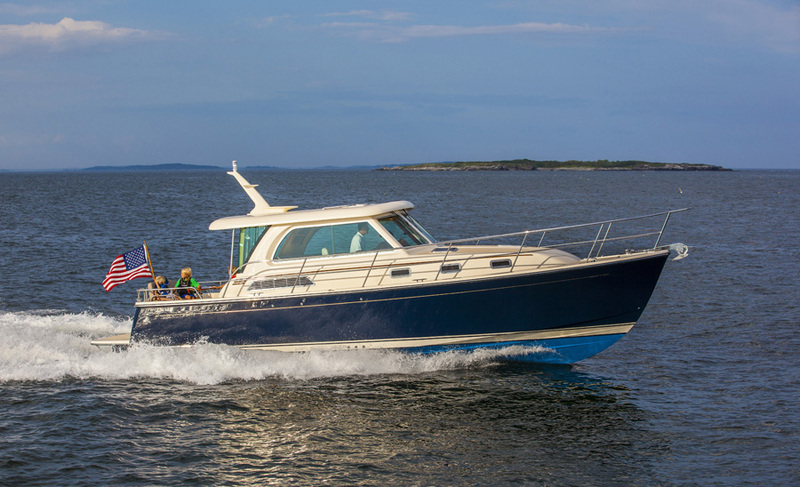 Many people dream of cruising the open sea, but they wonder if they can make that fantasy a reality in a boat that’s sized appropriately for their budget – which is why we let you know about Five Affordable Trawlers Under 40 Feet. And American Tugs enabled more than a few skippers to realize this dream when it launched its robust 34 back in 2000. 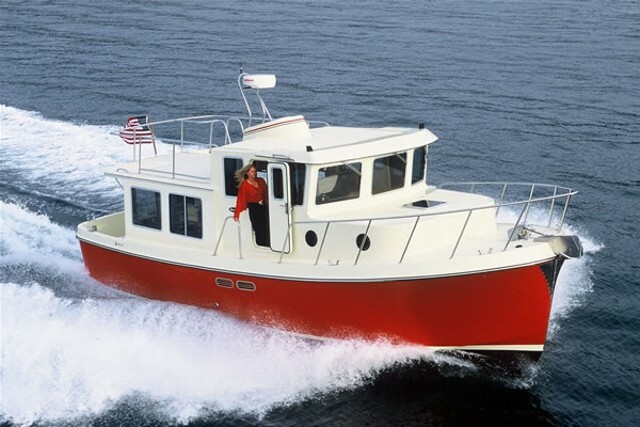 The American Tugs 365 was one of our picks for Five Affordable Trawlers under 40', and with good reason. That boat was based on a commercial-style hull that had been proven in the waters of the Pacific Northwest. 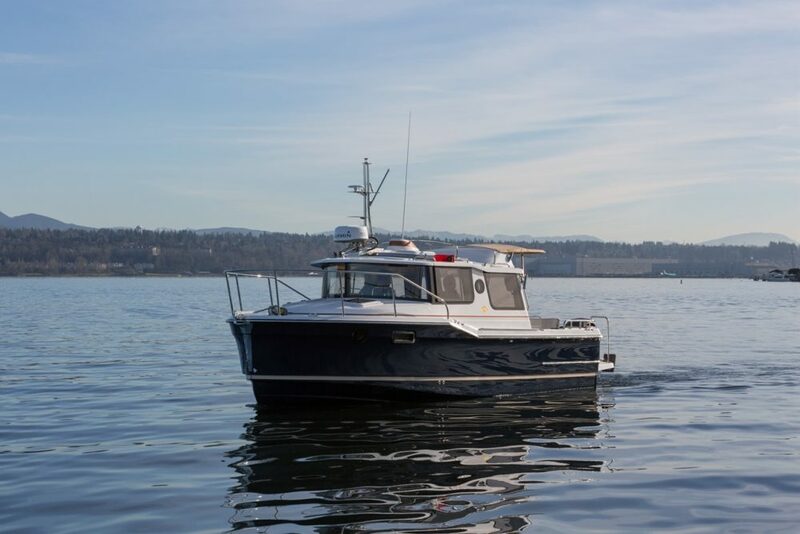 It also proved to be a capable running bottom for recreational boaters when in 2002 three owners of three 34s pulled away from a dock in LaConner, Washington, and traveled nearly 10,000 miles. The journey took them a year, but along the way the tenacious trio went up the Inside Passage, then south along the West Coast of the U.S. and into Mexico, Guatemala, El Salvador, Costa Rica, Nicaragua and Panama. Once through the canal, they pushed on across the Caribbean Sea and the Gulf of Mexico to reach Florida. The adventures of that group drew attention to the well-built cruiser. 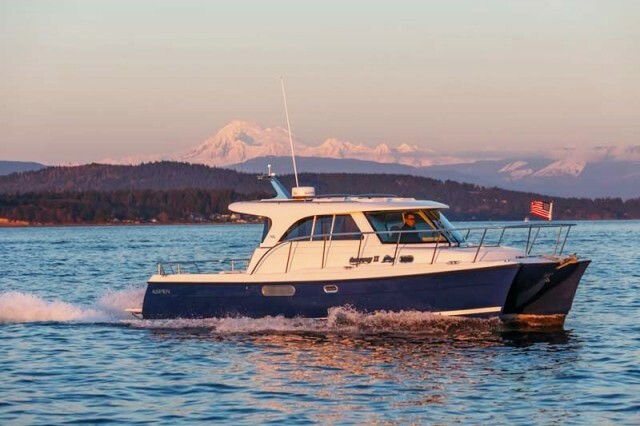 Today, the popular 34 has been replaced by the newer 365, but like its predecessor, this mid-sized trawler is equipped to go the distance and it’s sized and priced with a cruising couple in mind. The 365 is designed to run efficiently with a single diesel engine from Cummins or Volvo. 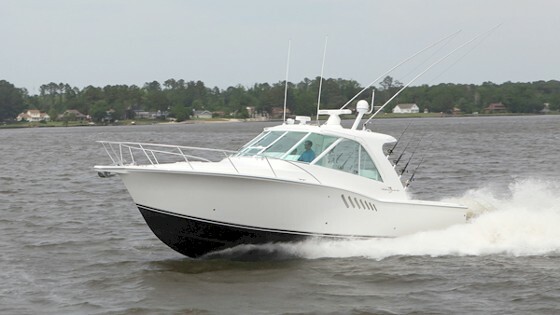 According to performance trials conducted by the company, the boat will run about 17 knots at full speed when powered by 380-hp Cummins, and burns 20 gph. That’s a swift pace to have in the event of bad weather, forcing a quick run back to port. 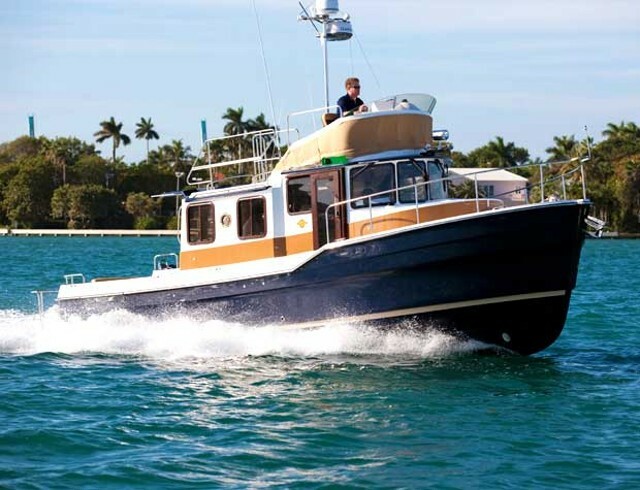 However, for best range and efficiency, most skippers run the boat closer to nine knots. At that speed, fuel burn drops to about 7.6 gph. And the 365 is designed to run quietly, too (thanks to plenty of insulation), as high noise levels only serve to make long cruises more fatiguing for the captain and crew. 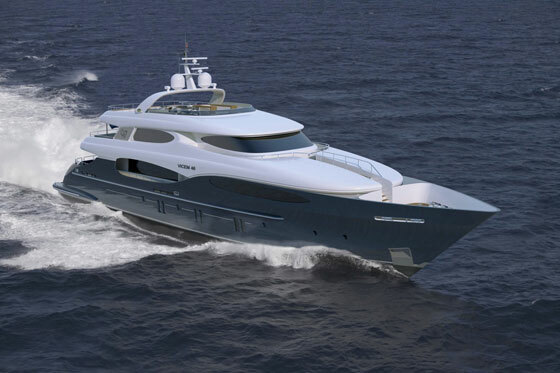 If anything, American Tug designs the 365 for comfort underway. There’s more proof of that in the salon, which is available in three configurations. All three show a big galley to starboard. Two of the configurations have an L-shaped galley with plenty of counter space. One layout features a convertible settee that sleeps two; the other replaces the settee with a pair of chairs. The third arrangement shows a straight galley countertop and a U-shaped settee that will double as a dining area. A few steps up from the salon is the pilothouse, arguably one of the nicest places to spend time underway. One of the neat design elements in this space is at the steps leading to the pilothouse from the salon. There’s a huge scoop cut into the ceiling over the stairs to keep passengers from banging their heads. The scoop flows upward into what can be called the smoke stack. At the top is a clear plastic plate that turns the faux stack and scoop into a skylight. For overnighting, there’s a private stateroom forward with a queen berth, hanging locker, stowage cabinets, and a head with shower stall. Here, and throughout the boat, are the grab rails and fiddled countertops that you would expect to see on a boat that’s designed for serious cruising. Because there’s only one stateroom, the 365 is really a boat for a couple, but with the convertible settee in the salon the owner can invite a friend or two aboard. And why not? 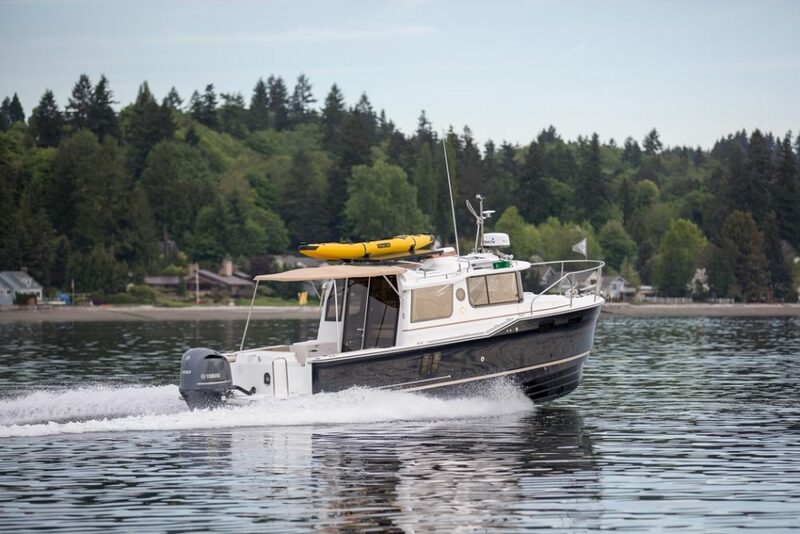 If you’re going to own a boat with the range and seaworthiness of the American Tug 365, it makes sense to share the journey with likeminded adventurers. For more information, visit American Tugs.